This New Focus 9064-X Triple-Divide Translation Stage is part of New Focus's patented Triple-Divide line of e*z*trac modular system. The bottom of the stage has a milled dovetail slot, which allows you the freedom to build these stages in a number of ways. 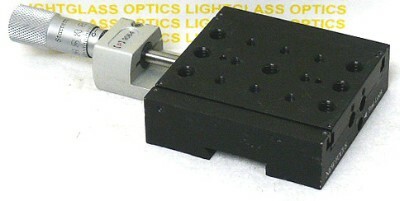 By mounting a New Focus dovetail rail directly to your optical table or breadboard, you have a simple and readily adjustable way of affixing this stage. You can also build this into X/Y and XYZ configurations. This is a low-profile stage that has ball-bearing construction, with the balls running on hardened and ground rod ways. The aluminum top is drilled and tapped with both #8-32 and 1/4"-20 holes. The micrometer actuator is included in the price.